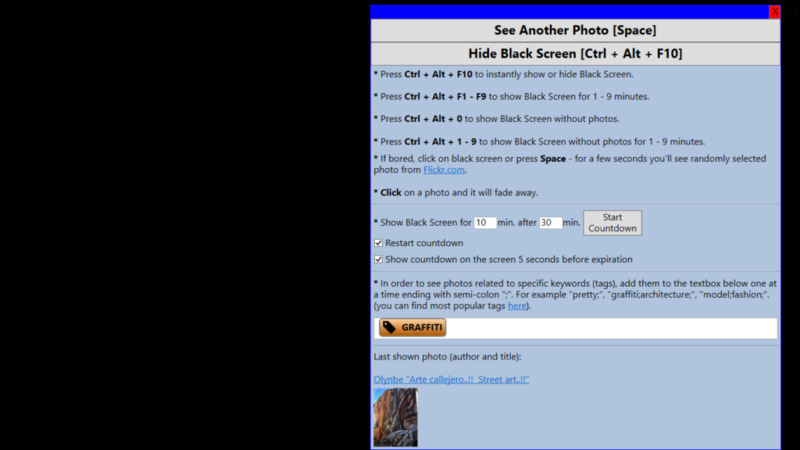 Black Screen is a program for people who spend long hours working on the computer. Pressing a key combination will turn your screen black. Press it again to return to the normal screen. It’s much faster than turning your display off and on. You can set it up to make your screen black every number of minutes. I set it up to make my screen black for 7 minutes after every 30 minutes of work. It forces me to take periodic breaks, not to sit at the computer for too long. It’s hard to stay focused during computer work. You often want to reset your attention – divert attention for a few seconds. With Black Screen you can quickly reset attention without getting stuck. Press it several times to keep yourself amazed with the stunning slideshow.